This article provides a detailed walkthrough of Microsoft Surface Dock Updater. 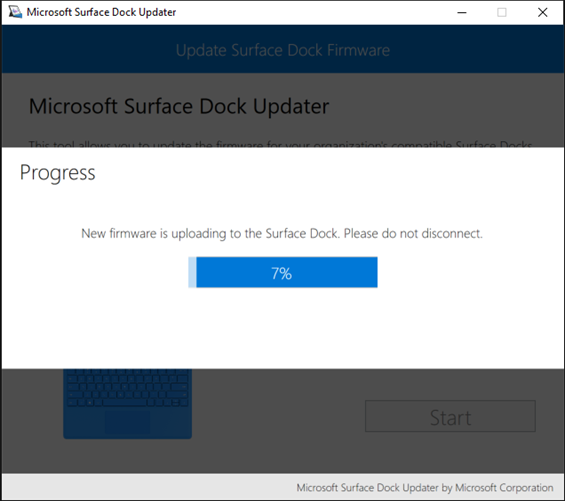 The Microsoft Surface Dock Updater tool allows you to check the firmware status of a Surface Dock and to manually update the firmware of Surface Dock devices. 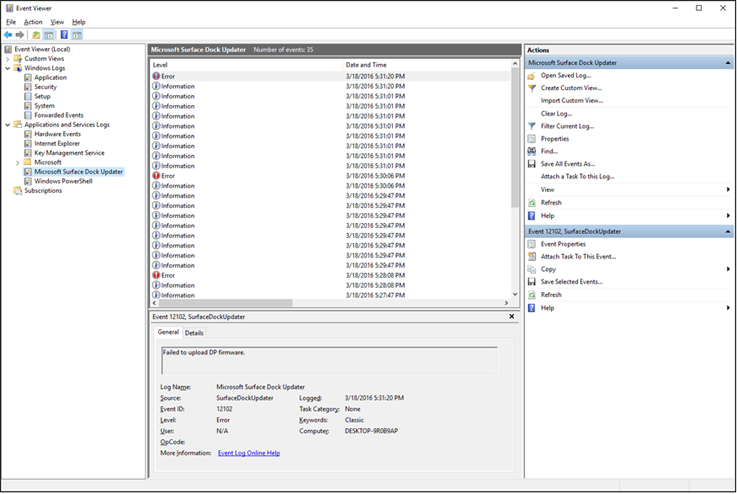 It is most often used to update Surface Docks prior to deployment of those Surface Docks to end users or as a troubleshooting tool. 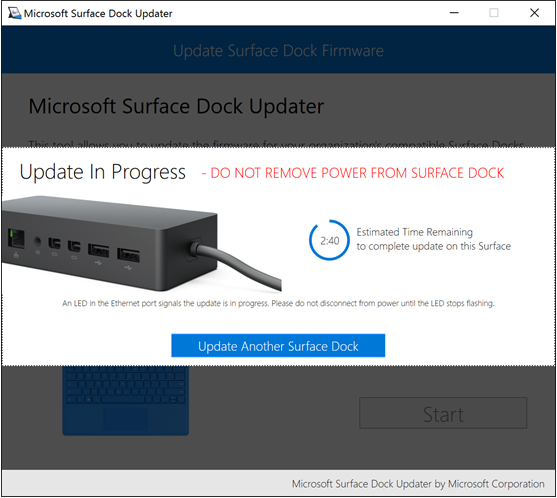 Microsoft Surface Dock Updater walks you through the process of updating the firmware on one or more Surface Docks, including the required connect and disconnect steps to perform the complete firmware installation. When you run the Microsoft Surface Dock Updater installer you will be prompted to accept an End User License Agreement (EULA). Updating Surface Dock firmware requires connectivity to the Surface Dock via the Surface Connect™ port. Installation of the Microsoft Surface Dock Updater is only supported on devices that feature the Surface Connect™ port. The Surface Dock Updater tool is unable to run on Windows 10 S. To manually update a Surface Dock for use with Surface Laptop and Windows 10 S, connect the Surface Dock to another Surface device with a Windows 10 Pro or Windows 10 Enterprise environment. After you install the Microsoft Surface Dock Updater tool, you can find Microsoft Surface Dock Updater under All Apps in your Start menu. Click Microsoft Surface Dock Updater to start the application. Click Start to begin the firmware update process. If you do not have a Surface Dock connected, you will be prompted to connect a Surface Dock. 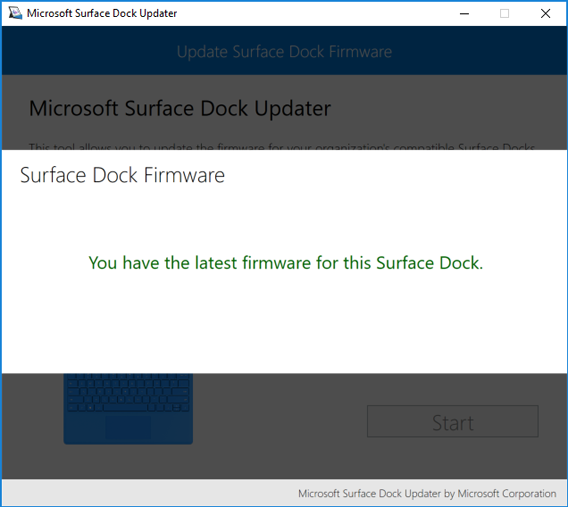 Microsoft Surface Dock Updater checks the status of your Surface Dock firmware. If the tool determines that the firmware of your Surface Dock is up to date, a You have the latest firmware for this Surface Dock message is displayed, as shown in Figure 1. If Microsoft Surface Dock Updater determines that the firmware of your Surface Dock is not up to date, a This Surface Dock is not running the latest firmware message is displayed, as shown in Figure 2. 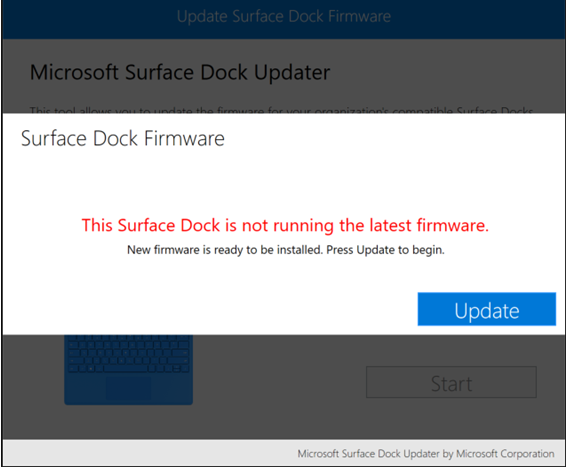 To begin the firmware update process, click Update on the Surface Dock Firmware page. Before the firmware update process begins, you will be prompted for confirmation. Click OK to proceed or Cancel to return to the Surface Dock Firmware page displaying the status of your Surface Dock firmware. As the firmware update is uploaded to the Surface Dock, a Progress page is displayed, as shown in Figure 3. Do not disconnect the Surface Dock while firmware is being uploaded. After the firmware update has successfully uploaded to the Surface Dock, you are prompted to disconnect and then reconnect the Surface Dock from the Surface device, as shown in Figure 4. The main chipset firmware update will be applied while the Surface Dock is disconnected. When the main chipset firmware update is verified, the DisplayPort chipset firmware update will be uploaded to the Surface Dock. Upon completion, a Success page is displayed and you will again be prompted to disconnect the Surface Dock, as shown in Figure 5. After you disconnect the Surface Dock the DisplayPort firmware update will be installed. This process occurs on the Surface Dock hardware while it is disconnected. The Surface Dock must remain powered for up to 3 minutes after it has been disconnected for the firmware update to successfully install. An Update in Progress page is displayed (as shown in Figure 6), with a countdown timer to show the estimated time remaining to complete the firmware update installation. If you want to update multiple Surface Docks in one sitting, you can click the Update another Surface Dock button to begin the process on the next Surface Dock. The LED in the Ethernet port of the dock will blink while the update is in progress. Please wait until the LED stops blinking before you unplug your Surface Dock from power. If the Surface Dock firmware update process encounters an installation error with either firmware update, the Encountered an unexpected error page may be displayed, as shown in Figure 7. Microsoft periodically updates Surface Dock Updater. Each update to Surface Dock firmware is included in a new version of Surface Dock Updater. To update a Surface Dock to the latest firmware, you must use the latest version of Surface Dock Updater. Before the Surface Dock firmware update applied by Surface Dock Updater v2.12.136.0 will take effect on a Surface Book device, a firmware update for the Surface Book Base is required. If you install Surface Dock Updater v2.12.136.0 on a Surface Book and update an attached Surface Dock from that same device, the firmware of the Surface Book Base will automatically be updated when installing the Surface Dock Updater. However, if you update a Surface Dock using Surface Dock Updater v2.12.136.0 on different device, and then connect that Surface Dock to a Surface Book where Surface Dock Updater v2.12.136.0 has not been installed, the benefits of the updated Surface Dock will not be enabled. To enable the benefits of the updated Surface Dock on a Surface Book device, Surface Book Base firmware must also be updated by installing Surface Dock Updater v2.12.136.0 on the Surface Book device. Surface Book Base firmware update is not required on a Surface Book 2 device.